Alvin Hugh McQuillan was born on September 15th 1895 in New York City. 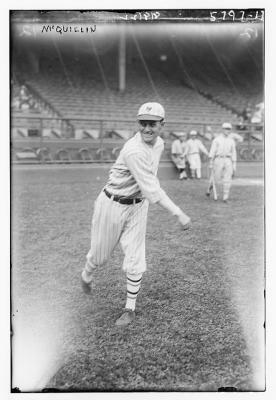 The six foot right hander began his career with the Boston Braves in 1918. 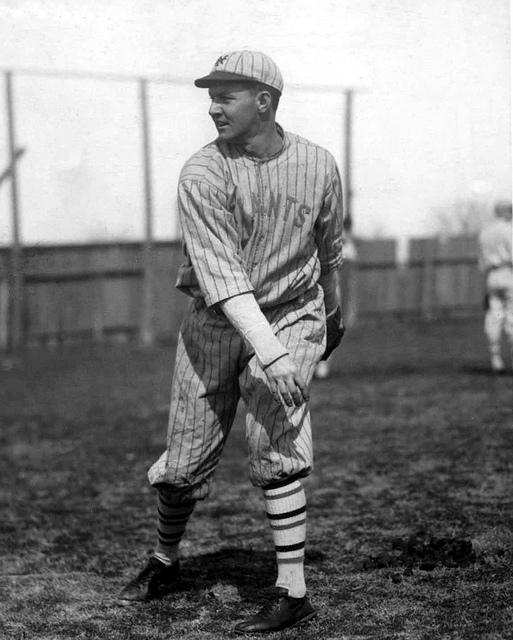 He pitched there into the 1922 season. He won double figures from 1920-1922, winning as many as 13 games but posted losing records each season. In those years the Braves finished seventh twice & a best fourth in 1922. That season New York Giants manager John McGraw wanted him on his staff, the Giants traded three players & $100,000 to get him. The deal was made on July 30th & came right after a controversial Red Sox trade with the AL New York club. These deals led to baseball adopting the June 15th trade deadline which stood for many years. McQuillan joined the Giants on August 4th and took two losses in his first two starts. But from there he won four straight to close out the month of August. He went 6-5 for New York as the Giants went on to win the NL Pennant. Post Season: That World Series was played entirely in the Polo Grounds since both the Giants & the AL New York team were both sharing the ball park. McQuillan pitched a complete game 4-3 victory in Game #4 benefiting from a four run Giants fourth inning. The Giants won the Series in five games. In 1923 he came back to win a career high 15 games (15-14) second on the staff to Jack Scott. He threw five shut outs with 15 complete games, posting a 3.41 ERA as the Giants went on to another NL Pennant. His first half of the season was much better as he was 10-5 by the end of July. Post Season: In that year's subway World Series he was the losing pitcher in Game #2 as the Giants lost the series in six games. In 1924 McQuillan went 14-8 with a 2.69 ERA. He was one of two fourteen game winners, pitching behind two sixteen game winner. That season John McGraw stepped down as manager after managing the Giants for 31 seasons. 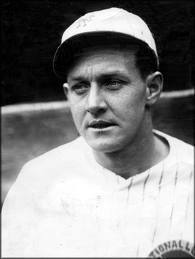 Hughie Jennings took over the team in August as they rolled on to another NL Pennant. Post Season: This time they faced off against the Washington Senators in the World Series losing in seven games. McQuillan was the winning pitcher in Game #3 although he was relieved in the fourth inning, by one of four Giants pitchers son the day. The Giants won the game 6-4 at the Polo Grounds. In 1925 he was limited to just 14 games, but returned in 1926 to go 11-10 for the fifth place Giants. Midway through 1927 he was traded back to the Boston Braves where he ended his career that season. In a ten year career he was 88-94 (53-44 in New York) with ten shut outs 16 saves 95 complete games & a 3.83 ERA in 279 appearances. Retirement: McQuillan remained in New York City residing in Jamaica Queens. He passed away in August 1947 & is buried in Calvary Cemetery in Woodside Queens.